Dental fluorosis is the pathological condition caused by fluorine over-intake: if the intake is over the optimal quantity (1mg/die) can cause problems to the enamel. In mild case, fluorosis can shows little white strikes on the enamel; in more severe case, the strikes are very porous and they can result altered chromatically. The enamel also results less resistant. In very severe case, brown spots and strikes can appear on the enamel. The situation is cumulative: it means that, if you do not treat them, the spots will become darker. Fluorine works on mineral components of tooth and also on the bacteria that form the plaque; it interact with the enamel during the odontogenesis and after the complete eruption too. This transformation needs exposition to little quantities of fluorine for long periods; during the final phases of odontogenesis, fluorine can bind to the surface of enamel contributing to enforce it. After the eruption, fluorine can bind to the surface and promote caries remineralization (if caries are in initial phases): in fact fluorine determines alterations in adhesiveness bond of microorganisms to the enamel and between them; fluorine also inhibits the acids production that are responsible in demineralization. Problems rise up when the fluorine intake is very high during the childhood, in the period between 20 and 30 months of age, while there is no more risk over the 8 years old. The gravity of fluorosis depends on the quantity of fluorine intake, the age of the child, the individual response, the weight, the degree of physical activity, the food and the growth of bones. Dental fluorosis is an irreversible condition caused by excessive ingestion (through water or food or supplementation) of fluorine in childhood, during the odontogenesis. It represents the first visible sign of fluorine overexposure in the child. In excessive amounts, fluorine damages the cells that form the enamel, called ameloblasts: the overdose of fluorine damages the phases of amelogenesis (enamel production) in permanent teeth (1-4 years aged). The damage of these cells produces a disturbance in the teeth mineralization, which increases the porosity of the enamel. Dental fluorosis has not only a cosmetic effect, but it represents also a toxic effect on teeth cells. The dental fluorosis can be recognized very easily because of some discoloration in the teeth. The first sign of fluorine overuse is the appearance of white spots on the enamel teeth, these spots can become furrows and cavities as the fluorosis aggravates. 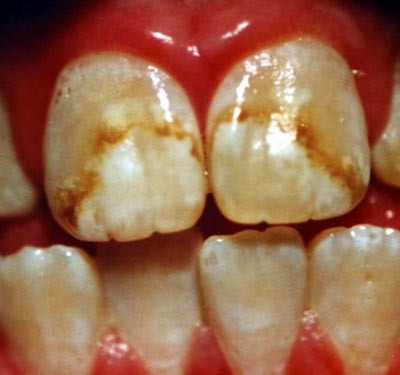 In severe fluorosis you can notice brown stains. Adolescents' perceptions of the aesthetic impact of dental fluorosis vs. other dental conditions in areas with and without water fluoridation. The diagnosis is based on clinical appearance. You must ascertain the fluorine exposure during the maturation phase of enamel. You need to do a differential diagnosis to see if the opacity depend on fluorosis or other pathology. The history of the fluorine started in 1931 when the American dentist Dean noted that in a region of Texas, characterized by water with a high fluorine concentration, the inhabitants had dark and stained teeth; he attributed this feature to fluoride poisoning and called this disease fluorosis . He explained, however, that the teeth fluorotic, even if ugly, were more resistant to caries. Later in 1939 Gerard J. Cox administered fluorides to laboratory mice, describing the greater resistance to caries in presence of a diet rich in sugars. In Italy, the first to speak of fluoride to the scientific community was Dr. Paul Trivieri, doctor of Anguillara; the town, located in the area of volcanic origin, had served by a source, where the fluorine which was present at high concentrations , 3-5 mg / liter. The dr. Trivieri described in 1940 the teeth of anguillaresi, blackened, filled with enamel defects. Describes, in short, the same fluorosis who had described Dr. Dean, but his conclusions are, surprisingly, the opposite: Dr. Trivieri concludes that these fluorotic teeth, because of their discontinuous and irregular surface, are more susceptible to caries. 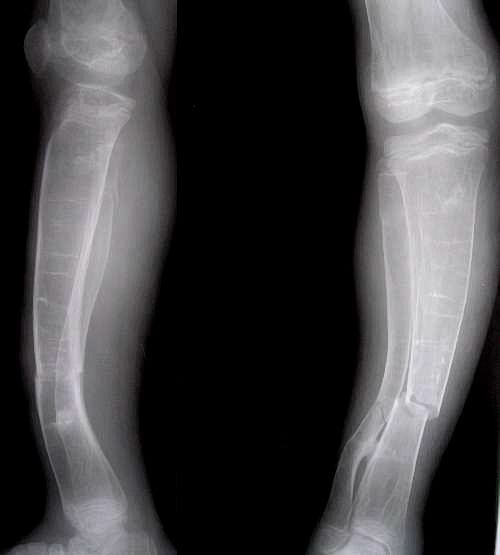 It also describes the fluorosis of bones, the deformities, fractures, the high brittleness of these bones( clinical picture now known as osteoporosis) indicating a correlation between this and high concentration of fluorine. Today there are countries that put fluorine in the water (water fluoridation), but the debate about the best treatment to practise has not been solved yet. Pay attention to the water your children (from 0 to 12 months aged) utilize: it must have low level of fluorine. Existing evidence strongly suggests that water fluoridation reduces tooth decay. There is also consistent evidence that it causes dental fluorosis, most of which is mild and not usually of aesthetic concern. There is no clear evidence of other adverse effects. Moderate-quality research exists as to water fluoridation's effectiveness and its potential association with cancer; research into other potential adverse effects has been almost all of low quality. In case of severe dental fluorosis there is a chance for your teeth to be completely damaged, so professionals do not recommend the teeth whitening. The damage caused by overexposure to fluorine is cumulative: it means that the fluorine remains in the bones, reaching concentrations too much high. The store of fluorine in the bones has two consequences: it increases the bone density, but it increases also the rigidity. The more rigid is the bone, the less resistant the structure is: it results less resistant to pressure because it is less elastic.